Have you been told that you need a website? Have you also been told how to generate traffic on your website? But the thing is, you’re not just interested in any traffic - you want traffic from the classical music community, and specifically from promoters and managers. With HELLO STAGE you will be able to create a website public to everyone. But more importantly, all the information you list there will be fed into our databases. This is rapidly becoming one of the most important tools for promoters when looking for soloists, ensembles, composers etc. Come take a look around and join us on HELLO STAGE! A free package option will always be available, giving you a web presence at no cost, with accessibility from all devices including smartphones and tablets. But we’re hoping to show you just how effective we can be to help promote YOU! We’re looking forward to seeing you online. 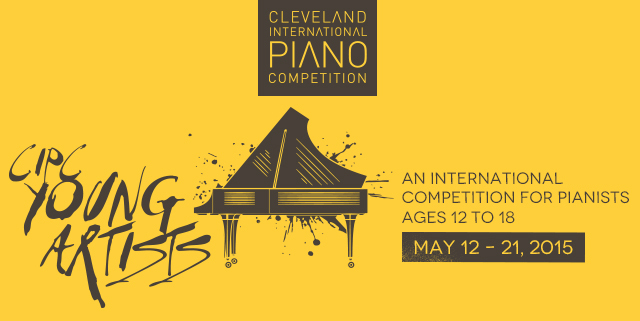 Applications are now open for CIPC Young Artists, an international competition for pianists ages 12 through 18 presented by the Cleveland International Piano Competition. Complete instructions for completing the application can be found HERE. The event will be held May 13-22, 2015 at Baldwin Wallace University in Berea, Ohio. Contestants will participate in two age groups: Juniors (age 12 to 15) and Seniors (age 16 to 18). Pianists from any country are invited to apply; those who are accepted will be housed in dormitories on the Baldwin Wallace campus for the duration of the competition. An institute will be held concurrently with the competition, during which time the students will receive master classes and coaching from members of the jury and guest lecturers. The institute also will feature guest artist recitals and symposia. Students in each age group will perform three solo rounds and one final round with orchestra in front of audiences and a professional jury. All candidates will perform two rounds before the first jury vote. Six candidates from each age group will advance to the Semi-Final round and two candidates from each age group will advance to the Final round. Instructions for completing the application and repertoire requirements can be found HERE. Please call the Competition office at 216-707-5397 with any questions. The information contained in this website is for general information purposes only. The information is provided by DT and while we endeavour to keep the information up to date and correct, we make no representations or warranties of any kind, express or implied, about the completeness, accuracy, reliability, suitability or availability with respect to the website or the information, products, services, or related graphics contained on the website for any purpose. Any reliance you place on such information is therefore strictly at your own risk. Through this website you are able to link to other websites which are not under the control of DT. We have no control over the nature, content and availability of those sites. The inclusion of any links does not necessarily imply a recommendation or endorse the views expressed within them. Every effort is made to keep the website up and running smoothly. However, DT takes no responsibility for, and will not be liable for, the website being temporarily unavailable due to technical issues beyond our control.